thermoIMAGER TIM 160 and TIM 200 infrared cameras are designed for stationary thermography providing an excellent price/performance ratio. These thermal imaging cameras are connected via USB 2.0 to a computer and are promptly ready for use. Various interfaces enable their integration into networks and automated systems. The thermal imager in the TIM 160 series are designed for precise measurement task due to their high thermal sensitivity. Furthermore, the system is distinguished by its high image frequency of 120 Hz. Powered from just one USB cable, the system is genuine plug-and-play solution. 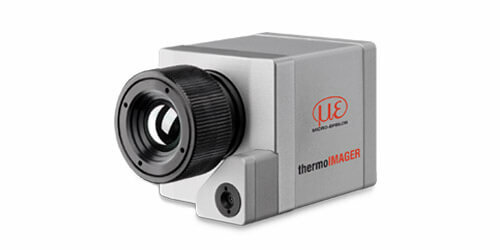 thermoIMAGER TIM 160: Thermal imager for numerous applications and process integration. 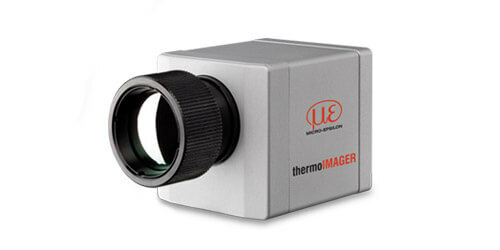 thermoIMAGER TIM 160/DK: Camera, several optics, tripod and calibration protocol in a suitable aluminum case - For universal analysis of infrared tasks. The thermoIMAGER TIM 200 from Micro-Epsilon operates by using new bi-spectral technology that combines two images into one. The compact USB infrared camera in the TIM 200 version is equipped with an additional visual camera that records an IR image and in addition to the real time image. The camera processes image information from different spectral ranges at the same time.